The ability to see web analytics data overlaid on the website you’re tracking and not just in the Matomo (Piwik) dashboard (via the new Overlay plugin). The ability to take and save notes for different days, so you will better understand why your data looks the way it does (via the new Annotations plugin). The ability to automatically update your GeoIP databases with the new GeoIP Auto-Updater. In addition to these big new features, there are four smaller new features, three usability improvements and 31 bug fixes. This powerful new feature was built by Timo, the same developer who created the equally powerful Transitions plugin in version 1.9. Page Overlay Analytics reports display your analytics data right on top of the website you are tracking. 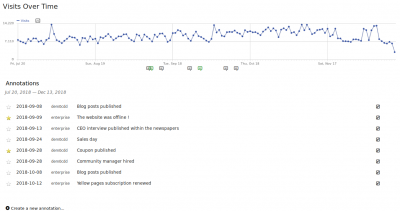 view your website’s overall analytics data right next to your website. view transition and evolution data while browsing your website. see where your visitors click on each of your webpages. Click here to see a demo of this new plugin. act on the new insights you gain when you view your annotations in the future. Click here to see the annotations we added to the Matomo (Piwik) demo. We promised this feature in v1.9.1, but unfortunately it proved to be more difficult to implement than we thought. Regardless, we managed to finish it in time for v1.10 and even added a bonus for those of you who haven’t started using GeoIP yet. If you’re currently using GeoIP to geolocate your visits, you can setup automatic updates for your GeoIP databases by going to Settings > Geolocation and filling out the form at the bottom of the page. 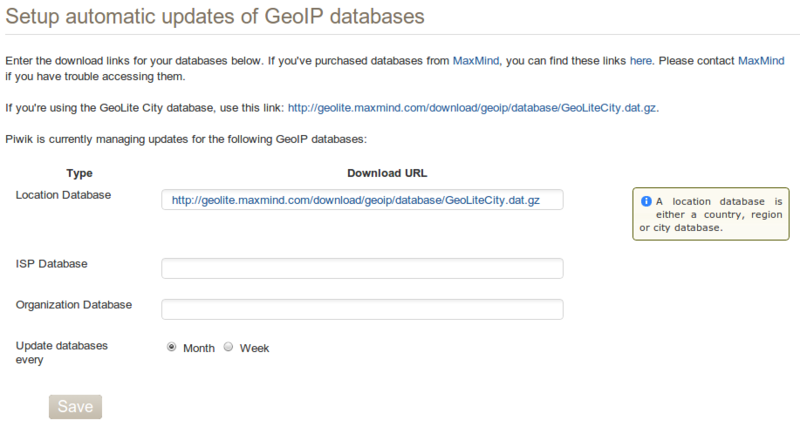 Clicking the ‘Get started…’ button on the left in the Geolocation admin screen will automatically download the free (but less accurate) GeoLite City database. 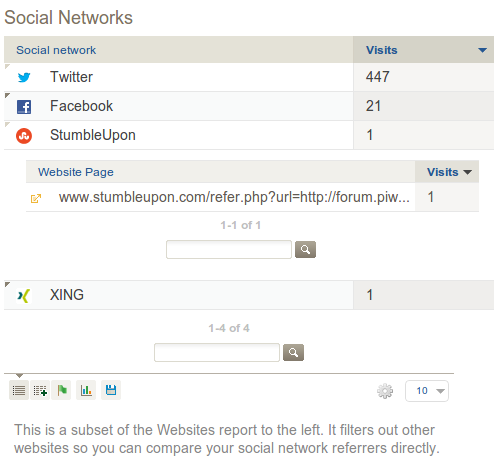 We’ve added a new report that will show you how many referrals you get from different social networks. See exactly which social networks send you the most visits, and which don’t. Then use this data to decide which social networks to invest the most time in. 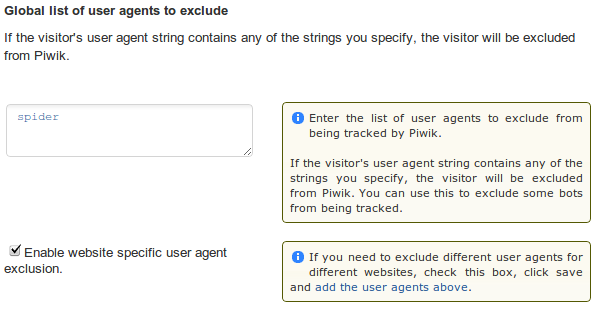 Sometimes it’s desirable to exclude visitors from being tracked, but there are no IP addresses you can exclude. The usual answer to such a problem is to exclude visitors based on what’s in the visitors’ User-Agent string. We’ve added the ability to do this in Matomo (Piwik) v1.10. 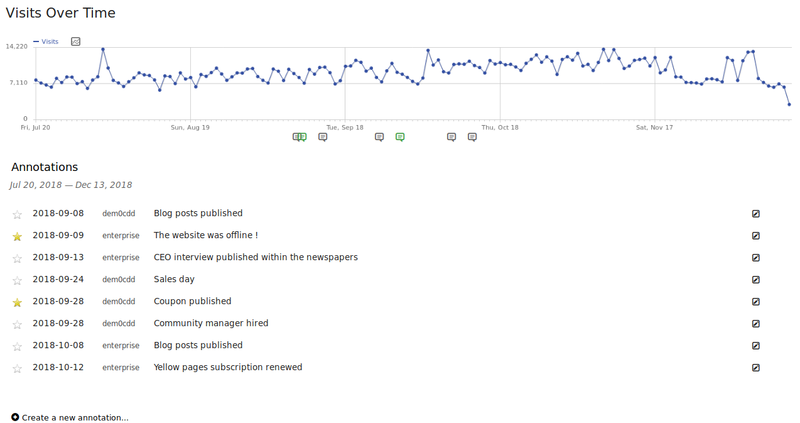 We’ve also improved the SEO widget by adding a couple new statistics and fixing issues with some existing statistics. cs ? The character set of the page that was viewed. country ? The visitor’s country. region ? The visitor’s region. city ? The visitor’s city. lat ? The visitor’s latitude. long ? The visitor’s longitude. For more information on these parameters, see the documentation here. Now, when you’re viewing visits in the visitor log and you see a returning visitor, you can click on the returning visitor icon to see all of their visits. It is also now possible to see the latitude and longitude of each visitor in the visitor log. We’re getting closer and closer to version 2.0, and we’re not going to stop! We’re working on implementing more of the features in the Roadmap in order to reach this important milestone. If you’d like to help us get there sooner then check out our new crowdfunding venture and help fund the features you’d like us to build or help support all of Matomo (Piwik) and donate. And as always, we’re going to squash as many bugs as we can. Are you a talented developer or an amazing User Interface designer, or do you like writing documentation or are a marketing guru? If you have some free time, if you are a do-er and not a talker ;-) and if you want to contribute to one of the most awesome open source projects around, please get in touch with the Matomo (Piwik) team, or read this page to learn more. For the full list of changes in Matomo (Piwik) 1.10 check out the Changelog. Thank you to the core developers, all the beta testers and users, our official supporters, the translators & everyone who reported bugs or feature requests. Stay tuned, we?ll have many new changes to show you in our next release. And please consider supporting or even participating in the project ? and if you like what you read, please tell your friends and colleagues, write on your website, blog? Happy Analytics using Matomo (Piwik) 1.10!